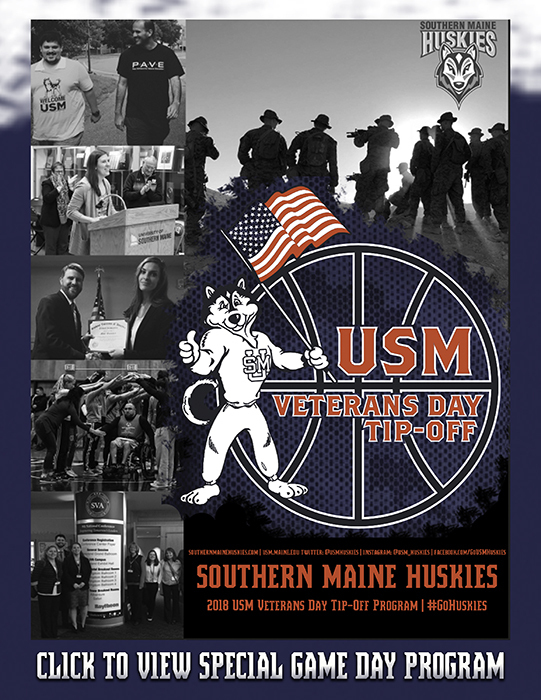 GORHAM, Maine – With less than 24 hours until the tip off of the 2018-2019 season, the University of Southern Maine Huskies' women's basketball team is hoping for a large turnout of fans from all four teams to help make its first USM Veterans Day Tip Off Tournament a memorable event – not just for an exciting two days of NCAA Division III women's basketball, but to also help the United States Marine Corps Reserves' Toys for Tots toy drive collect a large number of donations for underprivledged children in Maine. "We are obviously excited for the start of our season, as I am sure the teams from Thomas, Castleton and UMaine Farmington are, but we are also tremendously grateful to be honoring our veterans, and assist in the fundraising efforts by the Marine Corp Reserves Toys for Tots fundraiser, and host Alpha Company, 1st Battalion, 25th Marines," said fourth-year head coach Samantha Allen. "As USM is known for its commitment to veterans, and several of our student-athletes have or are presently serving in the armed forces, we are happily using this opening weekend to recognize our service members, and to showcase the great work being done at each institution to help veterans successfully make the transition to students in higher education."